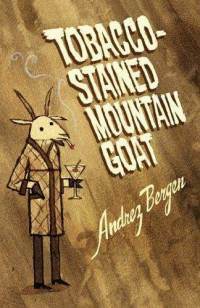 Andrez Bergen’s novel, Tobacco-Stained Mountain Goat, was released by Another Sky Press earlier this year. Billed as “Blade Runner with a touch of Sam Spade”, the novel fuses the tropes of the science fiction and detective genres (hardly a new idea in itself) and ends up being something genuinely different from either. And that’s always a good thing. Partly this is because of the post-apocalyptic Melbourne setting, where it never seems to stop raining, but mostly it is due to Bergen’s extensive (and I mean extensive) film references in the novel. This setup seems pretty standard. What is less standard about Tobacco-Stained Mountain Goat are those copious film references I mentioned earlier. To give you an example of what I mean, these are the films referenced in the first chapter: The Third Man, Spellbound and The Illustrated Man. Add to this the references to Cabaret Voltaire and Throbbing Gristle and you have a post-modern melange that is the most intriguing of novels. Into this heady mix is thrown a generous dose of the Japanese culture that Bergen himself must know so much about, given that he has lived in Japan for many years. So we have a fossil of an old lady wearing a kimono appearing during ‘The Test’, discussion of the meaning of Japanese words, and more film references, such as to Seven Samurai. This works well in combination with the run-down detective situation, of course recalling the aforementioned Blade Runner. Bergen writes assertively about Japanese culture and it works well enough on a gaijin like me. Early on we are introduced to the seductive Laurel, who ends up taking the place of the sickly Veronica in Floyd’s life, but not his heart. Floyd’s apartment, apartment 1001, is about as shambolic as the contents of his mind. The only alcohol remaining untouched is a bottle of Siamese vodka, and the only companionship emanates from the actors in films like The Big Sleep and The Maltese Falcon that constantly play on the TV. Like Chandler’s Marlowe, Floyd is very much alone in the world. Tobacco-Stained Mountain Goat is a novel that manages to be hardboiled and playful at the same time. What might otherwise be unremittingly bleak fare is lightened significantly by Floyd’s filmic imagination and his wisecracking wordplay. With little to sustain him (his diet seems to consist mainly of vodka, salt and vinegar chips, chocolate almonds and cigarettes), Floyd must struggle against both inner and outer demons. Alcohol seems to be the root of his problems, and he seems to get sozzled and beaten, not necessarily in that order, all too frequently. It’s an enjoyable read and one that I can heartily recommend to lovers of Melbourne, the detective genre, old movies, Japanese culture, or preferably all of the above. Rather impressively, the novel even contains an ‘Encyclopaedia Tobacciana’, explaining many of the cultural references dotting these pages. There’s even a Glossary and a list of recommended films. A word on this novel’s publisher, Another Sky Press. Based in Portland, Oregon, Another Sky has adopted a fairly radical publishing platform. Not only can you download their books for free, but if you want a physical copy you only pay how much you think the book deserves, plus a (miniscule) base price which would barely cover the cost of printing. I wholeheartedly approve of these policies and so should you. We need to support small companies such as this one to ensure that off-the-wall titles like Tobacco-Stained Mountain Goat reach the audience they deserve.